Item description: Court order, written on 25 August 1863 and certified on 26 August 1863, certifying a conscription exemption for a plantation overseer. The document shows $500 paid for the exemption and is an example of the so-called “Twenty-Slave Law” in action (see below). Item citation: From folder 18 of the George William Logan Papers #1560, Southern Historical Collection, Wilson Library, University of North Carolina at Chapel Hill. Before me the undersigned authority personally came Mrs. Caroline Mackey, who being duly sworn, deposes and says that after diligent search she can find no person to manage the affairs of her plantation in a suitable manner, to be placed in the stead of John Bradly has present overseer, so help her God. Before me the undersigned authority personally came Messrs. Charles E. Ramage and Herman Black. Two citizens residing in this Parish who being duly sworn, depose and say that of their own knowledge, John Bradly has been overseeing for Mrs. Carolina Mackey from previous to the year 1862, up to the present time and that he has been on said plantation as overseer five years. This is to certify that John Bradly paid Capt B.F. Cauthorn post A 2. U. More about this item: Find out more about the “Twenty Slave Law” here. 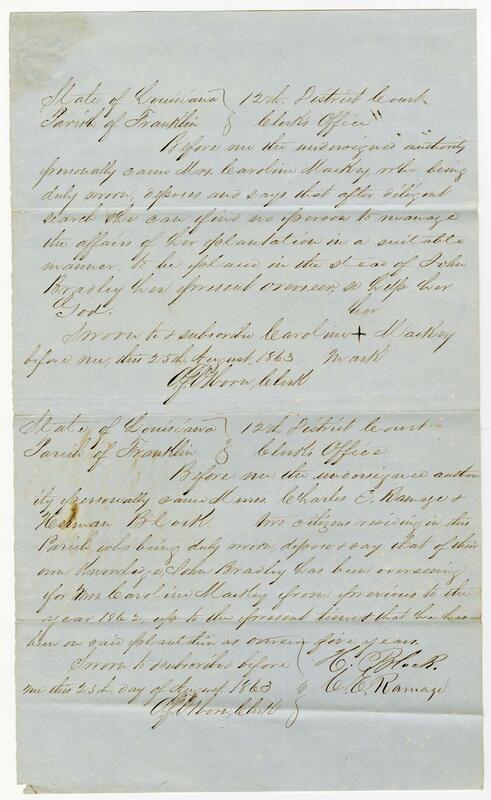 This entry was posted in Southern Historical Collection and tagged draft, Louisiana, Twenty Slave Law. Bookmark the permalink.